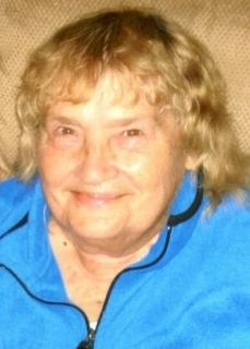 Marcia F. Ahrendsen, 75, of Wyoming, Iowa, died Monday, April 2, 2012, at St. Luke's Hospital in Cedar Rapids, Iowa. A celebration of her life service will be held at 2:00 p.m. Thursday, April 5, 2012, at Lahey Funeral Home in Wyoming, Iowa, with Shepherd Karmen Jamison officiating. Friends called from 5 to 8 p.m. Wednesday at Lahey Funeral Home in Wyoming. Burial was in the Green Center Cemetery, Morley, Iowa. Marcia Faye Chesmore was born on September 11, 1936 in Olin, Iowa, the daughter of Lloyd and Leola (White) Chesmore. She graduated from Olin High School in 1954. She married Lyle Ahrendsen on September 11, 1955 in Olin, Iowa. He preceded her in death on November 20, 2010. Marcia worked at Wal-Mart in Anamosa for many years, at Little Bear for ten years, and at the Town Super Market in Wyoming. She was a former member of the Wyoming Presbyterian Church, and a member of the Wyoming Legion Auxiliary. She loved her dog Tippy, flowers and gardening, golfing, working on Crossword puzzles and reading romance novels. Her specialty was baking chocolate chip cookies. She is survived by her children, Scott (JoeAnn) Ahrendsen of Tipton, Steve Ahrendsen of Roseville, California, Susanne Snead of Oxford Junction, Mike (Lawana) Ahrendsen and Jeff (Sandra) Ahrendsen, both of Cedar Rapids; twelve grandchildren, seven great-grandchildren; and two sisters, Marlene Sarby of Des Moines and Myrna Kasel of Dexter. She was preceded in death by her husband and her parents.